Another month, another Love Lula Beauty Box! Each month I wonder 'what will there be this time' and 'which brands will be featured,' and always hope for a big surprise. I like when I can't predict what will be inside a subscription box, and always want to see new products and a variety of names represented. Well, the July box certainly delivered on most of my wishes -- not only is there a newly released item, but three brands that have not been featured inside the Love Lula Beauty Box before! The July collection is worth £53, and has four full size items, one deluxe sample, and two sachets. While a few of the items are not necessarily things I would choose on my own, I am happy to try them out and I am excited to get creative with how I end up using the products. I see a lot of bath potions and hair elixirs in my future! Balm Balm Tea Tree Organic Face Balm (30ml): I have actually used tons of Balm Balm's range, including their fragrance free face balm, and while I think the balm is great for anyone with dry or mature skin, it is not so suited to those of us with more sensitive faces. The balm is pretty slick and heavy, and even though this contains antibacterial tea tree oil which is great for combating unwanted spots, the heaviness of the shea and beeswax* make it a bit too much for my congestion-prone skin. However, even the product listing itself gives a lot of other ideas for how to use it, including as a cuticle oil, to make a tinted lip gloss, as an eyebrow tamer, to help grow eyelashes, and to sort out scratchy elbows or knees. I also like to use it on my feet as a foot balm, especially after a long day walking in sandals. Ooh! Oils of Heaven Organic Balancing Hemp Face Oil (30ml): We have seen Ooh! oils several times in the Love Lula boxes, including in the February edition earlier this year where we received the newly launched Avocado Oil. I ended up using that one as a hair treatment rather than a face oil since my skin can be a little sensitive and gets congested easily, and I have a feeling I will be getting creative with the most recent new release as well. The Hemp Oil is the latest to join the Ooh! Oils of Heaven lineup, and is made with 100% cold-pressed cannabis sativa seed oil (hemp). According to Love Lula, this oil is "naturally rich in essential fatty acids, omega 6 and omega 3 while having an ultra-low comedogenic index, making it suitable for all skin types including oily skin and skin prone to acne. Skin feels tighter and firmer providing your skin with deep hydration and protection without clogging the pores. The low comedogenic index makes it a dry, non-greasy oil." The oil itself has a very earthy smell that may not be for everyone, but I find it grounding and very soothing. I have tried this on my forehead a few times now and my skin does genuinely seem to get on with it, but I have so many face oils waiting to be used that I think this one will mostly end up being a hair treatment. Maybe mixed with a drop or two of rosemary essential oil? That will certainly help lift the scent a bit and make it more fresh. My.Haircare Infuse My Colour Treat (250ml): To be honest, I was really confused by this product to start with. I was not sure if it was a hair treatment or a conditioner, and I had no idea if it was suitable for natural hair. The My.Haircare range is a brand new to Love Lula, and they provide vegan friendly products for coloured hair that do not contain parabens or silicones. Since I have not touched mine is several years, I was very lost as to what to do with this bottle! The instructions and product listing do not mention using on untreated hair, and no one seemed to be able to provide an answer on the Facebook group. However, I took the plunge and have been using this on the ends of my hair for almost a week now and have to say this is a pretty good conditioner. The formula is not super rich, but it does pack a bit of a punch, and my ends have been feeling healthy and soft without any greasy residue. I will call this a win! I will say I will probably end up gifting the rest of my bottle to my mum, not because I don't like it, but because she does regularly dye her luscious locks and will make better use of the product. 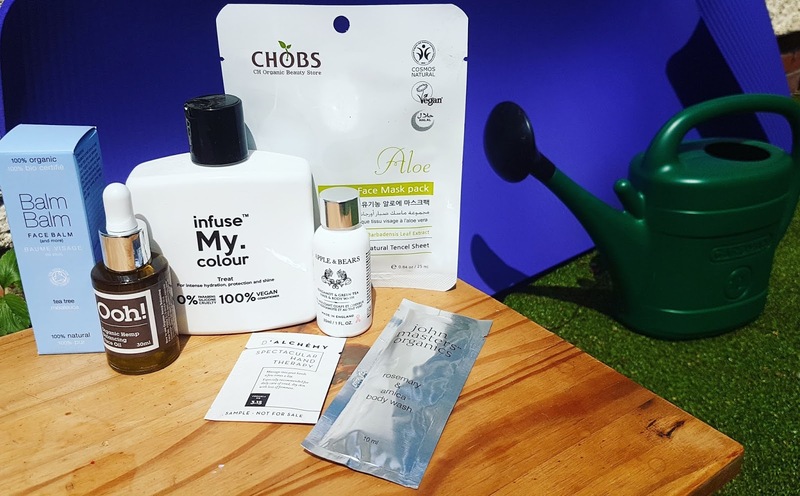 Chobs Aloe Face Mask: Chobs is another new-ish addition to the Love Lula family, and I actually ordered a handful of these sheet masks last month to try out but had not gotten around to testing them. When I saw the aloe mask in the July collection I knew it was time to finally set some time aside to give it a go. The sheet mask is made from natural tencel, and the serum inside contains organic aloe vera as well as skullcap root, peony root, and a variety of essential oils. Ideal for those looking for a moisture boost, this item is fantastic for summer and maintaining healthy glowing skin. The mask fit my face pretty well, though I did tear off the upper lip piece since it was hard to keep it in place, and I found the smell refreshing and calming. Suitable for vegans, COSMOS certified, and containing 100% natural ingredients, this was a total win for me. Apple & Bears Bergamot and Green Tea Luxury Hair and Body Wash (50ml): I have actually talked about Apple & Bears before, so you all know I love the scents they create and the gentle formulas they provide. I will say I was confused by the label on this one though, as it says hair and body wash, yet all the listings on LL just say body wash. I won't be using this in my hair, as personally I avoid using too many ingredients on my hair and try to keep things simple. The product is free from SLS, parabens, phthalates, gluten, artificial fragrance, and alcohols, and is also suitable for vegans, so it probably fine to use as a shampoo in a pinch, but since I have finally struck a healthy balance with my locks I do not want to disturb that! I will be using this in the bath and shower though -- the bergamot and green tea smell is sooo lovely and is seriously a 'luxury' experience. The gel suds up well and leaves your skin feeling really clean and soft. Happy to have another travel-friendly bottle of this gorgeous body wash. Ingredients: Aqua (Water), Aloe Barbadensis Leaf Juice Powder*, Cocamidopropyl Betaine, Lauryl Glucoside, Sodium Cocoamphoacetate, Disodium Lauryl Sulfosuccinate, Coco-Glucoside, Glyceryl Oleate, Sodium Chloride, Decyl Glucoside, Parfum (Fragrance), Sodium Benzoate, Citric Acid, Potassium Sorbate, Citrus Aurantium Bergamia (Bergamot) Fruit Oil*, Maltodextrin, Camellia Sinensis Leaf Extract*, Tocopherol, Hydrogenated Palm Glycerides Citrate, Camellia Sinensis Leaf Oil, Citrus Aurantifolia (Lime) Peel Oil Distilled, Citrus Aurantium Dulcis (Orange) Oil, Citrus Aurantium Bergamia (Bergamot) Leaf Oil, Citrus Medica Limonum (Lemon) Peel Oil, Citrus Nobilis (Mandarin Orange) Peel Oil Expressed, Cupressus Sempervirens Oil, Elettaria Cardamomum Seed Oil, Ferula Kokanica Resin Oil, Juniperus Mexicana Wood Oil, Myristica Fragrans Fruit Oil (Nutmeg), Ocimum Basilicum (Basil) Herb Oil, Rosmarinus Officinalis (Rosemary) Leaf Oil, Salvia Sclarea (Clary) Flower Oil, Citral, Limonene, Linalool. *Ingredients from Organic Farming. D'Alchemy Spectacular Hand Therapy (): I have not used this yet, as I am saving it for my flight next week! Flying always dries out my skin and hair, so I will be popping this in my carry on luggage so I can keep my hands moisturized and comfortable. D'Alchemy's hand cream is a rich and nourishing formula that is meant to give instant care and "optimum moisturisation." According to Love Lula, "The cream leaves a fine protective film on the skin, protecting hands against dryness and external aggressors. Anti-ageing plant extracts prevent skin ageing and strengthen the epidermis, stimulating its regeneration. A specially selected complex of natural plant oils regenerates the epidermis. On application the skin becomes soft, smooth, and hydrated for a long time." The brand is vegan friendly, has been through clinical trials, and is free from harmful synthetics, meaning this is one I can't wait to try out! John Masters Organics Rosemary & Arnica Body Wash (10ml): I have used several JMO products in the past, and actually really love their shampoo* which did a lot to help balance my hair and scalp. I haven't used this sachet yet, as I will probably wait until we go on a weekend trip. The ingredient list looks alright, and I imagine rosemary and arnica smell very calming which will be nice to use while on holiday. I will check back in when I have gotten around to using this sachet. Overall I was pleased with this month's box since it contained a lot of new names, full size products, and a new release. I do question the inclusion of two face products in the same box (that is a whole lot of oil, especially in the summer months!) and am never too keen on sachets, but the surprises outweigh my small concerns. My only disappointment was that Love Lula did not take part in #PlasticFreeJuly -- only one of the seven items had glass packaging, and the rest were plastic. However, I will say that everything is recyclable (except the sachets - boo!). My favourite item for July? Surprisingly it is one of the most budget friendly options in the box! I LOVE the Chobs face mask -- it is one of the first sheet masks I have tried that has not irritated my skin and left it red and burning. Most I have tried in the past have far too much serum and include either too much essential oil or not so nice preservatives (like the dreaded phenoxyethonal). This was a brilliant discovery, and I already have a handful more of the six varieties to use! 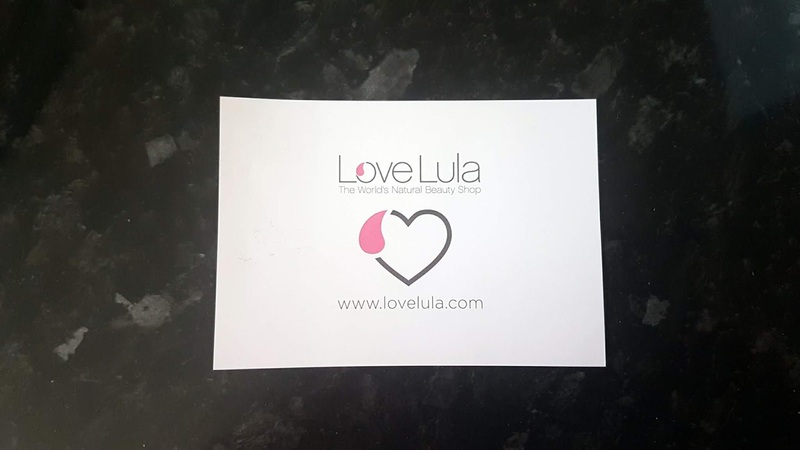 What was your favourite find in the July Love Lula Beauty Box?? Let me know in the comments below, along with any other thoughts you have on this month's edition! And if you are interested in subscribing, be sure to do so before the end of the month so you can get the August collection! You can sign up for a month to month membership or you can prepay for a set subscription -- for just £13.95 you can receive a minimum of five cruelty free (and usually green) beauty products sent to you every month that are always worth triple or more what you pay! That aloe face mask sound so perfect for this warm weather! My face has been so red and aloe really soothes it. Beauty boxes are like getting a surprise lucky dip to discover new products. It sounds like you got some nice products in your box. I particularly like the sound of the two body washes. I've heard a lot about D'Alchemy actually! Might have to check them out a bit more!